We are rerunning this post from last year. Every year we get requests to run "Lost Dog" notices on our Facebook page after the fireworks show. Most of the requests say that the dog was lost in the vicinity of Montrose Harbor. We have no way of knowing how many of these dogs find their way back home. Don't take your dog out where there will be fireworks. In Uptown, there's the professional show at Foster and Marine put on by the Saddle & Cycle Club, but there are also plenty of amateurs showing off, all day, in the parks, until long after midnight. You never know when and where the loud noises will come from. Leave your pets at home. No dog ever thought, "Golly, I love fireworks and loud noises!" 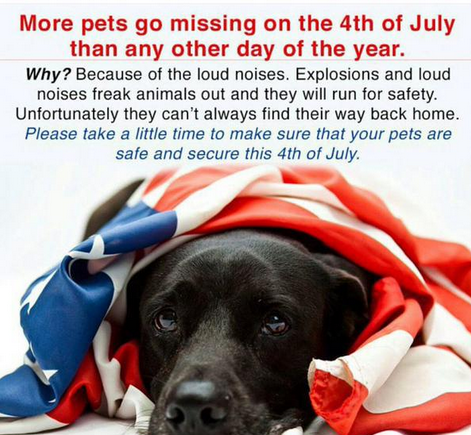 If you are tempted to leave your dog in your yard, be aware that it will hear the fireworks and do anything it can to get away, including try to get over the fence, and possibly get caught or injured in its attempt to escape. Ditto for leaving it inside with screened windows. A good friend lost her dog for two weeks when it bolted through a window screen, terrified of the loud noises. Leave music or the tv on if you leave home, so that the sounds are less startling to your pet. Make sure that your pet's microchip information is up to date and that your dog has a collar with up-to-date tags. Pro tip: If you have a pet, make sure you have a recent photo of it. If you find a pet, ask people who claim it to bring a photo of the pet to ensure that it is really theirs. If you find a pet who is separated from its owner, you can take it to a vet or animal hospital. Most will scan it for a microchip for free. A 24-hour animal ER is at 3123 North Clybourn, near Western and Belmont. If you have lost or found a pet, list it on Lost Dogs Illinois or Craigslist Lost & Found. If you are separated from your pet, we are more than willing to run it on our Facebook page. You can contact us through the page or via email.